They are not only the perfect gift idea in general, they also come in handy when the person giving is not quite certain about the recipient’s specific taste. And, in the rare case that the recipient is still undecided after 45 days from date of issuance, we offer a 90% repurchase guarantee on any amount of $100 or more. 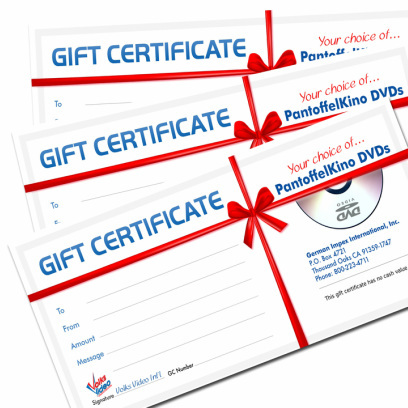 Pantoffelkino Gift Certificates do not carry an expiration date and can be ordered in any US Dollar denomination for any amount. We’ll always be happy to print a short congratulatory or so note on your certificate.